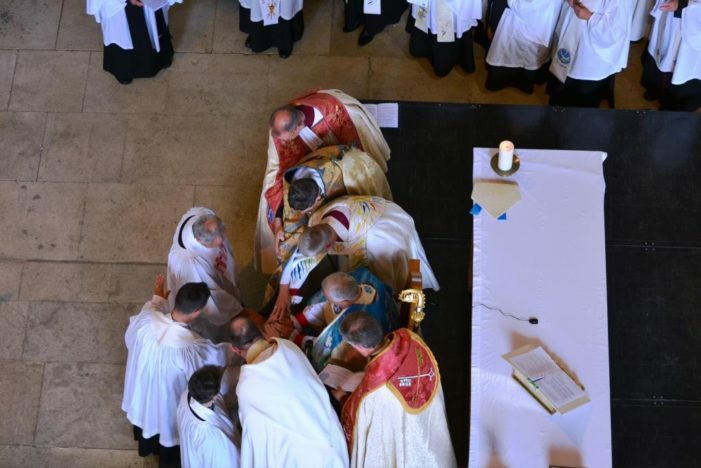 The laying on of hands at The Ordination of Priests service. The laying on of hands at The Ordination of Deacons service. It was a joyful and triumphant day at Peterborough Cathedral on Sunday 24th June as two Ordination Services took place to ordain Priests and Deacons into the Diocese of Peterborough. In both services, the candidates were presented one-by-one by the Archdeacons of Oakham and Northampton to the Bishop of Peterborough – the Rt Revd Donald Allister. 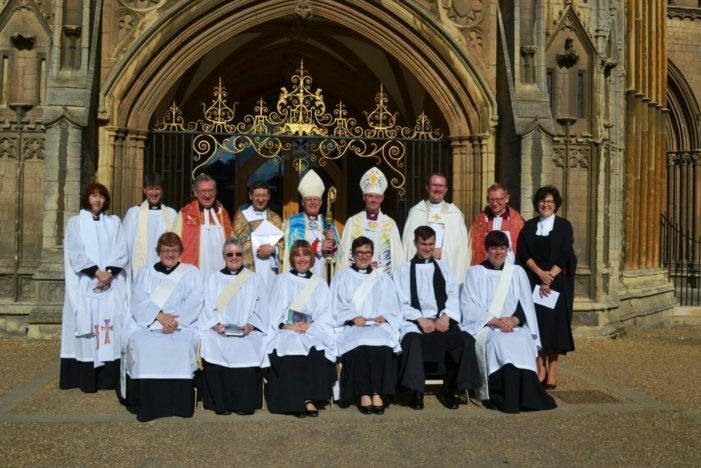 They formed a line before Bishop Donald, and confirmation was made of their calling to serve in their particular ministry. After readings from Isaiah 40:1–11 and Luke 1:57–79, there were two warm and humorous sermons from the Bishop of Brixworth – the Rt Revd John Holbrook. 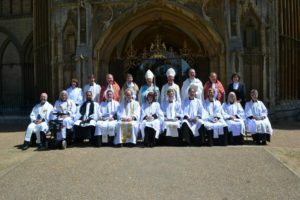 In the Ordination of Priests service, Bishop John referred to the 11 candidates as “an amazing group of people” and called on them to “be the in-between people – between those in the Church and outside, and between those people and God”. He also described Priests as “bridge people – connecting people with each other and with God”, and encouraged them “to know God, to know people and to introduce them to each other – and to make those relationships deeper”. 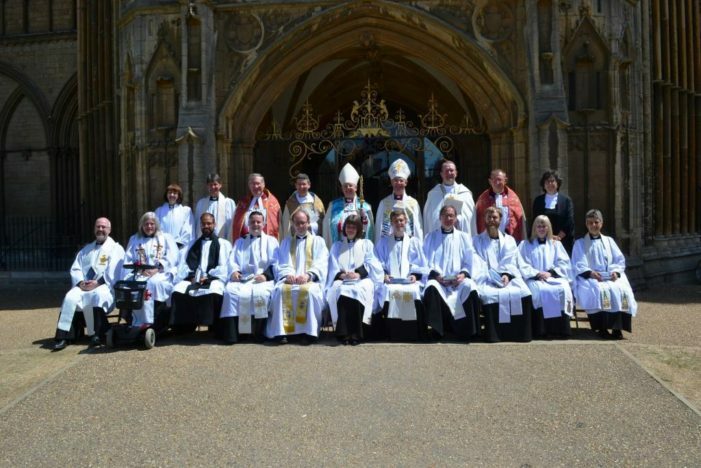 For the Ordination of Deacons, Bishop John described the six ordinands as “wonderful people with astounding stories of what God has done in their lives”, and pointed them to the example of John the Baptist – “a human signpost who was always pointing away from himself to Christ”. He stated that Deacons reflect Jesus “by their lives and presence. Their job is to prepare the way for Jesus – they are his supporting act”. After making vows to confirm their service in the Church, the candidates knelt for the laying on of hands – the Priests by nine senior clergy from the Diocese of Peterborough, the Deacons by Bishop Donald. 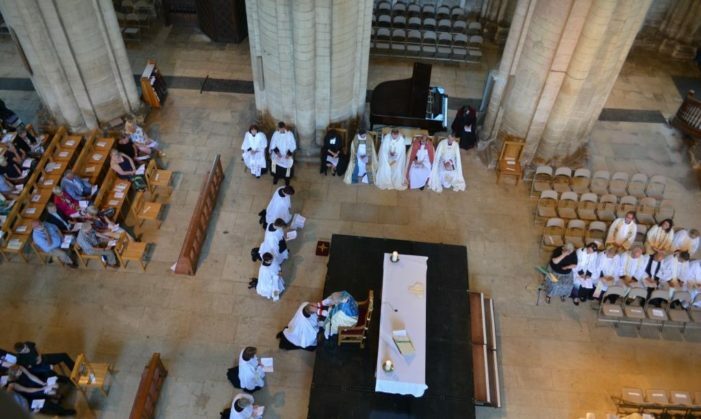 The newly-ordained Priests were then presented with Bibles and had their stoles adjusted, while the newly-ordained Deacons were given copies of the New Testament and had stoles placed upon them. They were then welcomed into their new roles. In the Ordination of Deacons service, this welcome gave way to a spontaneous standing ovation to acknowledge the start of their ministry within the Diocese. Banners were held up and the newly-ordained Deacons embraced their families and friends. And at the end of the service, there was another standing ovation as they left the Cathedral. It was a fitting end to a wonderful and uplifting day in which 17 dedicated ministers stepped out in faith and embraced God’s new calling on their lives.